Should be harvested in its dormant state to maximize its green waxy stems. They should be 32-33 inches long and two pounds to a bunch. Pruning back mechanically or by fire is needed to stimulate new flushes of growth. Hold at 34-36F, up to 2 weeks in water. From the Greek “kytisos”, the classic name for this class of shrubs. Some species are troublesome weeds in areas where they have become naturalized. More specifically, it is considered by some to be an invasive exotic weed where it grows naturally in the Pacific Northwest. Indeed, since 1980 untold millions of dollars have been invested without success to rid the countryside of this pest. It can take over any exposed area and its seeds can last 90 plus years on open bare ground and still germinate. 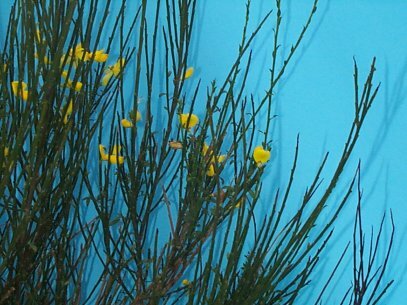 The specific epithet name “scoparius” means broom-like. One of relatively few plant species that can transform nitrogen from the atmosphere into a nitrogen form that plants can use as a fertilizer. The stems can be gently shaped into curves for dramatic effects in arrangements. Fresh stems have a white center when broken.